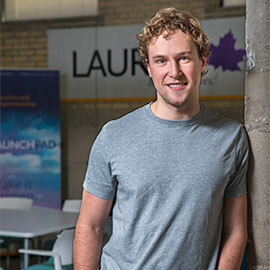 Jones, who recently graduated from Laurier’s Philosophy program, developed the company with University of Waterloo Environmental Studies graduate Cole McLay. Jones and McLay, along with support from Anne Forler, LaunchPad program leader, will be competing with students from internationally renowned universities such as the Harvard Business School, Brigham Young University and the Massachusetts Institute of Technology (MIT). There will be approximately 40 quarterfinalists from around the world, with the finalists being judged by Silicon Valley entrepreneurs Steve Blank, Alex Osterwalder and Nathan Furr. In 2014, first-year Laurier School of Business and Economics students Andrew Paradi and Brandon Chow placed first in the Canadian Business Model Competition with their company Teknically and placed in the top four Canadian teams in the international competition.